We’d love your help. Let us know what’s wrong with this preview of Gilt by Association by Karen Rose Smith. To ask other readers questions about Gilt by Association, please sign up. Gilt by Association by Karen Rose Smith is a 2015 Kensington Publication. I got in on the ground floor with this series and knew right away I was going to love it. Somehow or other I missed this book when it came out, so I have read the fourth book, but not this third one. So, I checked it out with my overdrive library account in order to catch up. When her mother's best friend, Louise, is found murdered, Caprice looks into the case at her mother's request. It turns out Louise has a secret past, a complicated marriage, and more enemies than one might think. On a more personal note, Caprice is still struggling with her feelings for Grant and Seth, is trying to help her sister adjust to caring for a newborn, and training her new puppy. This was a very good mystery which kept me guessing all the way to the end. I love Caprice, and her vintage clothing style, and her big heart. She's a great amateur sleuth because she doesn't just luck into solving the case, she actually gets out there and works to find clues just like a real detective would. She may be a little too nosy, but she doesn't take it too far. Naturally, with two Cocker Spaniels in my house and three cats, this story, which features my favorite dog breed, is a plus, and I love the animal rescue storyline, and appreciate the time taken to add a few facts for readers, such as a list of what types of plants are toxic to pets, which is a great reminder we can all use, and of course the fabulous recipe at the end. Overall, this is a very solid and satisfying addition to the series and I am thankful by library had it. I take it there was a book before this one as through out the story Caprice mentions her involvement in a previous murder investigation case. While it doesn't make a huge difference in this particular case, it's often mention was a bit annoying and could have been limited. But I guess the author had to since Caprice's "relationship"with Grant was based on their encounter in her first investigative case where he apparently saved her life. But other than that snag, I really enjoyed Caprice as a character who was dedicated, loyal and true to those she cared about. Part of the premise threw me off: staging houses for sale (get that) and having lavish themes and full meal catering to support it (never heard of it). I googled it, and apparently it's a thing. Who knew. The other part I struggled with was the all-inclusive details. Now I'm all for details when they move the story along, or are small clues that help lead you to the killer, or give you insight into the character. But this was just overboard (and oversharing) on the author's behalf. Some examples: Part of the premise threw me off: staging houses for sale (get that) and having lavish themes and full meal catering to support it (never heard of it). I googled it, and apparently it's a thing. Who knew. "The fireplace in the library shared a chimney with the one in the living room. Built-in bookshelves lined the wall around it. Caprice could remember her dad working on those bookshelves when she was little. He was somewhat of a perfectionist in his work and the project had lasted months as he'd found the time to do it. After they were finished, they all had shelved favorite books there. Two of hers were Anne of Green Gables and The Black Stallion. They were still there." Great, but none of this mattered to the story. "After Caprice said good-bye and ended the call, she set her phone on the counter and plugged it in to charge. She had a charger down here and one upstairs to make life a little more convenient." Ummm, okay? Caprice De Luca is a home stager. Her job is similar to an interior decorator, but home staging is preparing someone's home to be as appealing as possible to potential home buyers in the real estate market. It's close to Valentine's Day, and Chet and Louise Downing hire Caprice to stage their house for a quick sale. Louise is Caprice's moms best friend. Caprice is appalled when she discovers Louise dead in her greenhouse. She's been shot at close range. Mom is devastated and asks Caprice to inve Caprice De Luca is a home stager. Her job is similar to an interior decorator, but home staging is preparing someone's home to be as appealing as possible to potential home buyers in the real estate market. It's close to Valentine's Day, and Chet and Louise Downing hire Caprice to stage their house for a quick sale. Louise is Caprice's moms best friend. Caprice is appalled when she discovers Louise dead in her greenhouse. She's been shot at close range. Mom is devastated and asks Caprice to investigate. Caprice's inquiries lead her to a variety of people associated with Louise. Their cautious remarks and limited answers push Caprice to contact Marianne, her news reporter friend. With the information Marianne digs up, Caprice is quickly able to deduce who the killer is and what their motivation was. Although, I was able to guess the murderer's identity early on in the story, that didn't diminish my entertainment by the story as I watched the clues unfold and the motive revealed. Caprice's family, her dog, Lady, and her business are her greatest blessings. This is a wonderful series that I highly recommend. This fun and relaxing tale with mystery and romance is a great read. The De Luca Family is very close. Caprice and Nicki worked handling Open Houses for selling real estate. Caprice does the setting and Nicki caters the buffet table. At an open house Caprice finds the owner, Louise Drowning murder in the greenhouse.. Louise is a good friend of their Mothers and Caprice fells compel to investigate. She needs to find Louise's for the answer. All the regular characters are mention. The first time I This fun and relaxing tale with mystery and romance is a great read. The De Luca Family is very close. Caprice and Nicki worked handling Open Houses for selling real estate. Caprice does the setting and Nicki caters the buffet table. At an open house Caprice finds the owner, Louise Drowning murder in the greenhouse.. Louise is a good friend of their Mothers and Caprice fells compel to investigate. She needs to find Louise's for the answer. All the regular characters are mention. The first time I have read this author and feel the series should be read in order. I definitely read this author again and recommend the series. This particular installment in the series wasn't as compelling as the others that I've read so far. It felt a bit slow action-wise, and some of the dialogue didn't feel as dynamic or spirited. Quite a bit of filler, too, it seemed. Having said that, however, it was good mystery. I was also happy to spend some time with the mc and her family, and look forward to more in the next book. A good 3.5* for this one. Loved this and I think you will also! I have read the first book in this series, and have the second book on my wishlist. Caprice De Luca investigates another murder, I jumped at the opportunity. I was not disappointed. The De Luca family is close knit and each member has a busy and complicated life. There are 3 sisters and a brother, each of whom seems to have relationship issues. Caprice and Nikki work together doing home stagings, Caprice with I have read the first book in this series, and have the second book on my wishlist. Caprice and Nikki work together doing home stagings, Caprice with decor and Nikki with sinfully decadent foods. It is emjoyable just to read about the environments they create but author Karen Rose Smith spoils us with several recipes at the end of the book. This book takes place in winter with Valentine's Day playing a major role in the story. It does help if you have read the previous two books but you will not be lost if you read this as a stand alone. This is one of those books you want both to read quickly and to absorb slowly as you are drawn in but do not want it to end too soon. I had several guesses as to who the killer might have been. We get both an entertaining cozy murder mystery in this book and a feel good novel about family life and friends. Gilt by Association by Karen R Smith is the third book in the Caprice De Luca Home Staging series. Caprice, our protagonist is a home stager, puppy trainer, babysitter, vintage dress finder and crime solver. In her third adventure she finds that her frozen February becomes more chilling when her client is found dead. And like any great murder mystery the killer will be revealed one detail at a time. What I like about cozy mystery series is that many of them give you enough background information Gilt by Association by Karen R Smith is the third book in the Caprice De Luca Home Staging series. Caprice, our protagonist is a home stager, puppy trainer, babysitter, vintage dress finder and crime solver. In her third adventure she finds that her frozen February becomes more chilling when her client is found dead. And like any great murder mystery the killer will be revealed one detail at a time. What I like about cozy mystery series is that many of them give you enough background information to read the books as a stand alone or out of order. Gilt by Association is just such a book. This book is my introduction to the series and I have to say, I enjoy the characters. It is a quick read and while I think the killer was a bit of a stretch it was not implausible. It kept me interested throughout the only thing that gave this book an okay rating was the home staging part. Not that interesting to me, but is not something that would turn most readers off. I recommend it as well as the series to any cozy mystery fan. This third installment of the Caprice De Luca Mystery series is the best yet. Karen Rose Smith has really developed her characters since her first two books. We're back in Kismet, PA where murder hits too close to home this time, when Caprice's mother's best friend is found dead. As Caprice comes across clue after clue, I had a pretty good feeling as to the identity of the killer. But there were enough twists to make me doubt myself at times. Ms. Smith is a wonderful story teller. Her likable char This third installment of the Caprice De Luca Mystery series is the best yet. Karen Rose Smith has really developed her characters since her first two books. Ms. Smith is a wonderful story teller. Her likable characters, obvious love for animals (they always have a big part in her stories), and talent for creating a whodunit that will keep you turning the pages, are only a few of the reasons that keep me coming back for more. If you were a fan of the first two books, you're definitely going to love GILT BY ASSOCIATION. If you haven't read the other books in the series, you can still read this one and not feel lost. But I would recommend getting them all! This is Karen's 3rd book in her Caprice De Luca series. Sisters Caprice, who is a house stager and Nikki, who is a caterer, seem to be able to work together on many projects. They have been hires by their long-time family friend, Louise Downing, to stage her house, so she and her husband can finally enjoy their golden years. The girls leave Louise's home after a brain storming session, little did they guess that the next time they saw Louise, she would be dead. The De Luca family and Louise's hu This is Karen's 3rd book in her Caprice De Luca series. Sisters Caprice, who is a house stager and Nikki, who is a caterer, seem to be able to work together on many projects. They have been hires by their long-time family friend, Louise Downing, to stage her house, so she and her husband can finally enjoy their golden years. The girls leave Louise's home after a brain storming session, little did they guess that the next time they saw Louise, she would be dead. The De Luca family and Louise's husband, Chet are stunned when her death is ruled a homicide. Karen has a 4th and 5th book in this series coming out soon. Karen also writes romance novels, if that's your genre. Me, I always choose a cozy and am very glad to be able to read and review them. This book is part of a series of cozy mysteries. Caprice DeLucca, is a home stager who lives with her large Italian family in a small PA town. When she isn't staging homes, she is solving mysteries. In this story Louise, a close friend of Caprice's Mom ends up murdered in her greenhouse. Caprice discovered the body when she arrived at the house for a home staged open house. Louise and her hsuabdn, Chet, were selling the house and he was to retire from his pretzel company. Caprice promised her mo This book is part of a series of cozy mysteries. Caprice DeLucca, is a home stager who lives with her large Italian family in a small PA town. When she isn't staging homes, she is solving mysteries. In this story Louise, a close friend of Caprice's Mom ends up murdered in her greenhouse. Caprice discovered the body when she arrived at the house for a home staged open house. Louise and her hsuabdn, Chet, were selling the house and he was to retire from his pretzel company. Caprice promised her mother, Frances, to find Louise's murderer and so Caprice does her investigating. I absolutely love these books with Caprice De Luca and hate having to wait so long between books. I had never heard of home staging a house before selling it, probably because I don't own an expensive house. Caprice not only stages homes, buts she takes in strays and finds them new homes, she adores her family and is always there to help them out and is still trying to decide between the two men in her life. However, her life never seems to be busy enough because she also manages to find time to I absolutely love these books with Caprice De Luca and hate having to wait so long between books. I had never heard of home staging a house before selling it, probably because I don't own an expensive house. Caprice not only stages homes, buts she takes in strays and finds them new homes, she adores her family and is always there to help them out and is still trying to decide between the two men in her life. However, her life never seems to be busy enough because she also manages to find time to solve a murder. In this book, Caprice's mother's best friend is shot to death in her greenhouse. With any number of suspects, it is hard to guess who the murderer is. I didn't figure it out until the murderer was exposed. If you like reading books by Karen Rose Smith, you are going to love this book! This was my first book to read by Author Karen Rose Smith. I was not disappointed. Gilt by Association is a fantastic book and I thoroughly enjoyed reading it. This was not a mystery I could predict. It had twists and turns with some surprises and I love the characters, mystery and romance. The book seemed to be centered around Valentine's Day, but it's great to read anytime. I definitely recommend Gilt by Association and it's Book Three in the A Caprice De Luca Mystery series. I am looking forw This was my first book to read by Author Karen Rose Smith. I was not disappointed. Gilt by Association is a fantastic book and I thoroughly enjoyed reading it. This was not a mystery I could predict. It had twists and turns with some surprises and I love the characters, mystery and romance. The book seemed to be centered around Valentine's Day, but it's great to read anytime. I definitely recommend Gilt by Association and it's Book Three in the A Caprice De Luca Mystery series. I am looking forward to the next book. I really enjoyed reading the book Gilt by Association. I like when Seth surprises Caprice at the Valentines and spend some time together before returning to his fellowship and gives her momento think about him while he gone. It has to around the death of Louise downing Murder. It ends up that Mrs downing had a hidden past that ends up catching up to her and murdering her at the same time. It keeps you guessing who killed her in the first place. Caprice is a fascinating character. Her business is unusual. Now add in entertaining murders and you have a great book. Her friends and family round out the story line in Book 3 in a well built manner but her stray pets rescues and adoptions really give the story umph! Funny and well plotted, this is a series to keep reading. Love this series. Karen Rose Smith does not disappoint. I will be re-reading this book again and again. In spite of occasional clumsiness like this, and as much emphasis on puppy training as on home staging, this series' gimmick, I enjoyed the book and would read others by the author. I started this book in the middle of a snow flurry, and finished it the same day. I loved it. The characters and the little town of Kismet feel very much like family and home. This story especially, was fantastic, and it was a perfect way to spend my day indoors. I’m enjoying the characters, but this time the story just wasn’t doing that much for me. However I am loving the interactions between Caprice and Grant. I really enjoyed the involvement of the past, and Caprice's mom's best friend. Or were they really best friends? 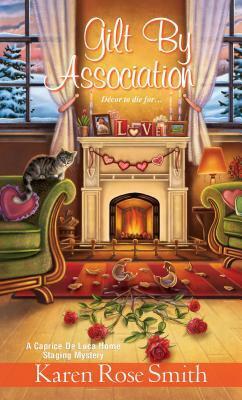 Karen Rose Smith has a great new mystery out: Gilt by Association, the third book in the Caprice De Luca series. This is the best one so far! This cozy mystery could be read as a stand-alone novel as any necessary information is seamlessly woven into the story but once you begin reading, you won’t want to miss the earlier ones. Caprice comes from the very close-knit De Luca family. Bella, her younger sister, is a wife and mother of two youngsters and a newborn. Caprice has her own Home Staging bu Karen Rose Smith has a great new mystery out: Gilt by Association, the third book in the Caprice De Luca series. This is the best one so far! This cozy mystery could be read as a stand-alone novel as any necessary information is seamlessly woven into the story but once you begin reading, you won’t want to miss the earlier ones. Caprice comes from the very close-knit De Luca family. Bella, her younger sister, is a wife and mother of two youngsters and a newborn. Caprice has her own Home Staging business, where she plans color, décor and furnishings for high-end homes so the owners can sell their home for top dollar. Her older sister, Nikki, has a catering business, and she often provides special hor d’ourves, beverages, and entrees at the open houses. And if one of her sidelines – investigating murders for which she just happens to find the bodies – causes problems, well, her brother and his business partner are attorneys! Caprice is a pet lover, often caring for homeless cats and dogs that find their way to her. It is a much safer sideline than helping the family or friends of murdered people find the murderer(s) and receive justice. She can’t say no to an animal – or friend – in need. She is training her new pet, Lady, one of the pups that she helped deliver several months earlier when she found a pregnant cocker spaniel. She is also a responsible pet owner, and the author gently includes various dog or cat specific needs or tips as part of everyday conversation. In her latest adventure, Caprice and Nikki arrive at the home of her mother’s best friend and her husband in final preparation for their open house to find her mother’s friend murdered. To help her mother find peace while grieving, Caprice begins to just ask a few questions around town. Of course, one or two questions lead her to clues to ask more questions… Can she find the truth before she or another friend is injured or worse? Caprice is a delight! I like her personality, hobbies, and values. She is outgoing without being obnoxious, and has a winning combination of a head for business and imagination aplenty to design and stage any home for selling. Her eye for color carries into her manner of dress, which is almost always colorful vintage chic. Family and friends part of her everyday life are strong, honest, intelligent, and wise men and women who are valued for who they are more than what they do. There is the strong possibility for romance, and a Valentine’s Day dance on the schedule. The plot is gently introduced and gathers momentum quickly until you realize you are on the final page. It is thoroughly executed with excellent organization. The Caprice De Luca Mystery series is as much a work of art as one of Caprice’s home stagings. Each story design is as intricate as antique lace, as sturdy and complete as a refurbished antique china cabinet, and as fun as watching a puppy play or holding a purring cat. For those readers who are not as cooking-challenged as I am, there are several recipes included that sound SO good! I highly recommend Gilt by Association to cozy mystery lovers of any age who enjoy a pet-loving sleuth with close family ties and partners in crime-solving, with a touch of romance, or to anyone who has previously enjoyed Karen Rose Smith’s books. Oh. Warning: Do not read in a library or anyplace where silence is required as you will LOL!! With a grateful heart, I received a copy of this book from the author through an “Escape with Dollycas” contest. All opinions are my own, and no monetary compensation was received for this review. Once again, I followed the clues with Caprice and could not wait to find out who done it. This is the third book in the Caprice De Luca Mystery series and I thoroughly enjoyed it. A 4.5 stars for me. In this outing Caprice's mother's best friend, Louise, is found murdered while she is staging her house. Caprice finds the body and is so upset, she really does not look at the clues of the scene. At her mother's request, Caprice looks into the case. There are various suspects, the cheating husband, Once again, I followed the clues with Caprice and could not wait to find out who done it. This is the third book in the Caprice De Luca Mystery series and I thoroughly enjoyed it. A 4.5 stars for me. In this outing Caprice's mother's best friend, Louise, is found murdered while she is staging her house. Caprice finds the body and is so upset, she really does not look at the clues of the scene. At her mother's request, Caprice looks into the case. There are various suspects, the cheating husband, the fired housekeeper, the mistress or possibly others. Maybe it was a robbery gone bad? As Caprice investigates, again finding information the police miss, it turns out Louise has a secret past, a complicated marriage, and more enemies than one might think. I had several suspects that I was sure were guilty but everyone was wrong. I finally figured it out just before the bid reveal at the end. On a personal note, Caprice is still struggling with her feelings for Grant and Seth. Seth is out of town and the emails seem to be slowing down, but Grant is still not making any kind of move and still is not opening up to Caprice. There is a bit of a romantic showdown in the book, but I do not want to give it away. She is trying to help her sister adjust to caring for a newborn, and training her new puppy. She is trying to help out with the Valentine fundraiser and of course finds another lost/abandoned animal. This was a very good mystery which kept me guessing all the way to the end. I love Caprice, and her vintage clothing style, and her big heart. She's a great amateur sleuth because she doesn't just luck into solving the case, she actually gets out there and works to find clues. She may be a little too nosy, but she doesn't take it too far. Of course, her sleuthing still puts her in some danger and Grant is not happy with that. Of course the usual cast of characters make an appearance, all her siblings, her parents, her nana, the veterinarian as well as Ace, the rockstar. I love the animal rescue storyline, and appreciate the time taken to add a few facts for readers, such as a list of what types of plants are toxic to pets, which is a great reminder we can all use. There are always recipes at the end and there is one in this book I am definitely going to try., and of course the fabulous recipe at the end. Gilt by Association is the third installment in the Home Staging Mystery series featuring Caprice De Luca. It's February in Kismet, Pennsylvania and Caprice is busy staging a home for her mom's best friend, Louise Downing. In keeping with her staging themes, Caprice is planning on a Hearts and Flowers open house and also trying to find the perfect dress for the annual Valentine's Day dance. Caprice finds Louise's dead body out in the greenhouse, surrounded by a box of her favorite chocolates. Whe Gilt by Association is the third installment in the Home Staging Mystery series featuring Caprice De Luca. It's February in Kismet, Pennsylvania and Caprice is busy staging a home for her mom's best friend, Louise Downing. In keeping with her staging themes, Caprice is planning on a Hearts and Flowers open house and also trying to find the perfect dress for the annual Valentine's Day dance. Caprice finds Louise's dead body out in the greenhouse, surrounded by a box of her favorite chocolates. When her Mom begs her to find out who killed her friend, Caprice readily agrees to investigate with the help of her sister Nikki and her brother's best friend Grant. It doesn't take long for Caprice to discover that Louise had some deep dark secrets hidden in her past, the woman's marriage to husband Chet wasn't all hearts and flowers, and perhaps she wasn't the best friend that her mom thought. Caprice is once again struggling with her feelings for Grant and is really hoping that he will invite her to the Valentine's Day dance, but she can't seem to forget about Dr. Seth Randolph. Nikki is in the midst of her own personal turmoil and she tries to decide if she needs to hire a partner for her catering company. Things heat up in the kitchen with the arrival of Chef Drew. The author really brings out the strong family relationship between the DeLucas. It's nice to have Caprice's Mom and Dad featured again, Grandmother Nana offers some wonderful advice to Caprice and things have worked out for the best with younger sister Bella, husband Joe and the new baby Benny. I think my favorite thing about this series is the animals. Caprice is very dedicated to training her new pup, Lady who she helped deliver in the last book. Sophia is still ruling the house from high atop her cat pole and Grant is working from home in order to spend more time with Lady's brother Patches. Caprice finds an abandoned 6 week old kitten that she names Valentine and Nana is going to adopt her. We have the opportunity to catch up with Rock Star Ace Richland and his endearing daughter Trista. It appears as though Ace's new girlfriend, Alanna Goodwin will feature prominently in the next book "Drape Expectations". With the winter months being slow season for the real estate market in Kismet, PA home owners know that anyone willing to search for a new home is serious about purchasing. Hired by Louise and Chet Downing to stage their home for an open house, Caprice DeLuca decides to use the time of year to guide her theme. As the open house will be over the Valentine holiday she goes with a hearts and flower theme. During one of their final consultations Louise seems a bit distracted and it seems there may be a problem with her marriage as well. Putting it down to stress Caprice and her sister Nikki who is catering the event gather their notes and leave. When Louise is found dead in her greenhouse Caprice's mother asks her to check into her death and see if she can find out what happened to her longtime friend. The more Caprice digs into Louise's past the more she and her mother realize they did not know their old friend as well as they thought they did. I read Gilt By Association after Drape Expectations, but as each book can be read as standalones it did not detract from either story. The plot is well thought out and planned. I loved the closeness of the DeLuca family members and how they supported one another. Clarice is an independent woman who dances to a different drummer. She idolizes the 60's style color scheme in both her decor and clothing. Her love of animals is shared by her family and her many friends. Caprice is willing to put it all on the line when she goes to help family or friend. Karen Rose Smith has a winner of her hands with Gilt By Association. As a bonus for her readers she gives us some delicious recipes to enjoy as well. My rating is 5 out of 5 stars. Gilt By Association by Karen Rose Smith is the third book in the Caprice DeLuca Mystery series and it is a good read. Caprice DeLuca is a house-stager for high-end clientele. Along with her sister, Nikki, who does catering, they host awesome open houses that are the talk of the town. When they agree to stage and hold an open house for their mother’s best friend, Louise, they never expected it to be the event of the century. Because they never expected there to be a murder right before the big ev Gilt By Association by Karen Rose Smith is the third book in the Caprice DeLuca Mystery series and it is a good read. Caprice DeLuca is a house-stager for high-end clientele. Along with her sister, Nikki, who does catering, they host awesome open houses that are the talk of the town. When they agree to stage and hold an open house for their mother’s best friend, Louise, they never expected it to be the event of the century. Because they never expected there to be a murder right before the big event. There are a lot of characters in this book and at times I got a little confused. I think if I had read book one and two I would not have been as confused, but since I did not read those two books, I had some trouble keeping all the characters straight. I also did not know the backstory for her family and friends so I had no reference point while I was reading. There also seemed to be a lot of mention of Caprice’s prior murder investigations, almost too much in my opinion. I did like Caprice and thought she was well developed and realistic. And I really enjoyed reading about her and her pets. Having a new puppy is keeping her very busy but she is very patient and works very hard to train the puppy properly. I also liked reading about her relationship troubles, but every once in a while I wanted to shake her and say “make up your mind”. The author is very talented in both her descriptions and her suspense writing. Much of the time I felt like I was right there watching all the action take place around me. I love when that happens when I am reading. And there are many twists and turns and many suspects to consider while trying to solve the mystery. I did not figure out who the killer was until it was revealed at the end. I would recommend this book to anyone who enjoys a well-written cozy mystery. But I would suggest reading the first two books so that you have all the background information on the many characters. That is what I plan on doing, getting the first two books to read. I was so excited to be able to read the third release in the Caprice DeLuca's mysteries. I became invested in this series with the first book, Staged To Death, where I first met Caprice. She is a lovely young woman with insecurities just like anyone else, but she tries to hide them. With the downward plunge in the economy she has had to reinvent herself from an interior designer to a home stager. She has taken a fledgling idea and turned it into a prosperous business. At present she has been con I was so excited to be able to read the third release in the Caprice DeLuca's mysteries. I became invested in this series with the first book, Staged To Death, where I first met Caprice. She is a lovely young woman with insecurities just like anyone else, but she tries to hide them. With the downward plunge in the economy she has had to reinvent herself from an interior designer to a home stager. She has taken a fledgling idea and turned it into a prosperous business. At present she has been contacted by Louise Downing, a family friend, to stage her home for a Hearts and Flowers Open House. With Louise's decorating style Caprice is lucky that it takes very little staging. The day of the open house Caprice arrives to go over last minute details and unfortunately finds Louise in her greenhouse lying on the floor fatally shot. Now Caprice has a lot going on right now and not just with staging homes, but she is busy personally also. She is very involved in animal rescues which has led to her latest addition to her house, a new puppy. She has been trying to train her, but also Kismet's Valentines Day Dance which she is working to help raise funds for the animal rescue shelter. So when her mother requests her to find out what truly happened to Louise how could she refuse. As Caprice follows clues she starts to find more out about Louise than she ever imagined. This is a mystery interlaced with both humor and a little romance. I love Caprice and the fact she loves all things retro. She is someone I could imagine as a friend and love how the author brings out her personality. She uses a lot of common sense when it comes to life plus she has a soft spot for animals. She loves her family and shows it. She is very confident in the job she does, but not it matters of the heart.